Granddad and his grandchildren will need plenty of help to recover all the goodies that fall out of their basket on the way to the picnic grounds. As in his Lost House (2016), Cronin relies on an intense, even garish palette to complicate the search for each errant item. 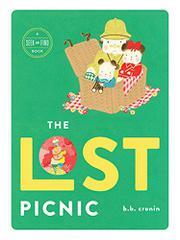 The picnickers—floppy-eared, chubby-cheeked anthropomorphic white dogs—tie a big basket to the top of their car. But as they start off, the basket’s lid pops open, and upon arrival: “Holy moly! It’s empty!” Spread by busy spread, the lost items are keyed by ominous hints in the narrative (“A banana would be a nice treat, but they’d better wait till the picnic”) and by significant dominant hues in each broad, bustling landscape through which they pass. Nevertheless, the items that bounce out of the basket are not only tiny, but hidden amid concatenations of architectural and natural features, traffic, piles of bric-a-brac, and other distractions, most colored in searing orange, pinks, yellows, and greens. The author does not provide a locational key, but he does gather images of all the food at the end so that viewers paging back will know what to look for, and he leaves his three picnickers replete and snoozing on the final page.